I found the Fountain of Youth and I have drunk from its restorative waters! Sadly, I don’t look or feel any younger - but that’s okay. Ponce de Leon’s Fountain of Youth Archaeological Park in St. Augustine, Florida is a fantastic journey back in time. Kit Keating, the Marketing Manager of the park, took us on a brief guided tour of the grounds which are spread out over 15 acres on the waterfront. "We are the oldest attraction in Florida and our guest book dates back to 1868!” said Mr. Keating. Keating also told us that the Fraser family has owned the property since the 1920’s and has consistently refused numerous lucrative offers from developers. First explored by Ponce de Leon in 1513, this is the site of our country’s oldest continuously inhabited city settled in 1565 by Pedro Menendez de Aviles. When Menendez arrived, he found a thriving town of the Native American Timucuas. Unfortunately, although the Europeans lived side by side with them, the Timucuas were decimated by the diseases that the Europeans brought with them. Politically motivated warfare did not help and the last known Timucuas died in Cuba in the early 1700’s. Today you can see a large, reconstructed Timucuan family house as well as an anihi paha which is a special meeting house. We spoke with a lady dressed in period costume who was making clay pots decorated with traditional Timucuan designs which could be purchased in the gift shop. She showed us how the Timucua used a wooden paddle with a design on it to press the decorations into the surface of the pot. In 1587, Franciscan friars constructed the first mission in the Continental United States. Nearly 400 years later in 1934, a gardener planting an orange tree discovered a Timucuan skeleton. When a large number of skeletons were found, the pattern and position of burials revealed the actual location of the 1587 mission. The mission has since been reconstructed using historically correct methods and local cypress which is resistant to wood-eating insects. Mr. Keating informed us that all bodies unearthed are reinterred with Native American and Roman Catholic ceremonies. “BOOM!” That was just the cannon being fired exactly as it was in the days of the Spaniards. This is done at regular intervals by employees in period costumes. They also offer an exhibit where they shoot period firearms. A gorgeous flock of nearly 30 Indian peacocks and peahens populate the grounds. The males include white peacocks which resemble snowflakes when they extend their feathers to attract a mate. They may even pose for your photographs! You can hear their raucous calls echo all throughout the park. Towards the end of the day, you can spy them roosting in the trees for the night. As we walked the grounds, we met Dr. Kathleen Deagan, Distinguished Research Curator Emeritus of the University of Florida Museum of Natural History. She and her team of docents were busy removing a very thin layer of soil from a site located about 18 inches below ground level. The Navigator’s Planetarium reveals how the European explorers used the stars as navigational tools to cross the vast oceans to and from the New World. We were shown how these brave explorers used the astrolabe and the quadrant in conjunction with the stars to calculate to a surprising degree the exact latitude of their ships. This hourly show turns the sky back to April 2, 1513 - the night before Juan Ponce de Leon landed on the shores of Florida. Want a Chalupa while in the park? You’ll have to go to the boathouse for that. No, it’s not a Mexican dish! Mr. Keating showed us an authentic, life sized model of this boat which the Spaniards used for routine water transportation. Period maps indicate the presence of a Chalupa as well as a boatyard here. Now for the big moment: the actual Fountain of Youth! The Fountain of Youth is housed inside a 60 year old coquina building that encompasses the original spring that was recorded in a seventeenth century Spanish land grant. 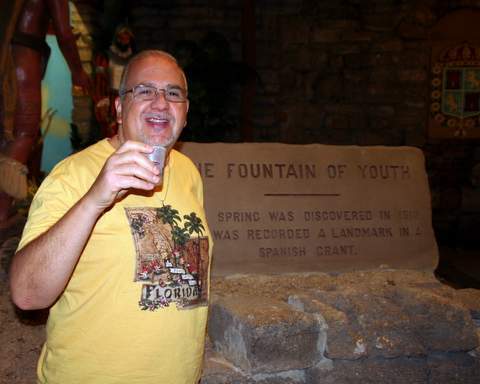 The Fountain of Youth is the oldest attraction in Florida with signed guest books dating back to 1868. “The fountain has to be pumped up some 268 feet from the original Floridian aquifer,” Mr. Keating informed us. We were given a plastic keepsake cup commemorating St. Augustine’s 450th anniversary and the fountain of youth. I filled my cup halfway and was warned that it would taste of sulfur but it didn’t! In fact, it tasted just fine. I am sad to say that my wrinkles, my arthritis and my grey hair didn’t go away. Oh, well! I did enjoy perusing two showcases of artifacts dug up on site. There’s so much more to see and discover so don’t miss Ponce de Leon's Fountain of Youth Archaeological Park in St. Augustine, Florida. The park is handicap accessible, leashed-pet friendly and school groups are welcome. Ponce de Leon's Fountain of Youth Archaeological Park even hosts weddings and special events in their 3,000 square foot New Events Pavilion. Ponce de Leon's Fountain of Youth Archaeological Park is located at 11 Magnolia Avenue, St. Augustine, FL USA. Phone: 904-829-3168. For more information about Ponce de Leon's Fountain of Youth Archaeological Park, visit www.fountainofyouthflorida.com/index.html.